Ever wonder who our “Top Haunts” are? This list contains some of the scariest, most high-tech, unique, creative and thrilling haunted houses our reviewers have seen! Each year, our Scream Teams visit and review hundreds of haunted attractions from across the country! that means… yes, we have actually been to all of the attractions that you will see on this list. We don’t allow them to pay or bribe us to be included in this list, we promise you that. All of these haunts have earned their spots here! We do understand that not everyone’s experience in these haunts will be the same, however we do hope that you get to experience the same quality of show that we were able to see. We wanted to show you which ones are currently ranked the highest out of all of the haunts that we reviewed during the 2015 season. The actual ranking is based on the review scores given to these haunts by our “Scream Teams” during the Halloween haunt season. Coming in at number 13, the 65 acres of Hell known as “Reaper’s Revenge” consisted of 4 separate attractions in 2015. Our professional haunt review team, Team Scary Potter, stated that this is an extreme attraction where, “…they will horrify, harass and handle you!” “Is Reaper’s Revenge worth a trip and your hard-earned cash? Absolutely. Something that we love about Reaper is that the attractions are vastly different from one another – it isn’t the same scares repeated over and over for an hour and a half. Clever and creepy scene design, capable acting, and a wide variety of unique frights combine to make Reaper’s Revenge a must-see haunted experience that we highly recommend!” It takes an estimated 75 – 90 minutes to traverse all of the attractions that are mostly outside so be sure to plan accordingly. Reaper’s Revenge’s overall 2015 Scare Factor score was a 9.39 out of 10! Only in their 5th season for 2015 and coming in at number 12 our on our Top Haunt’s list is Insanitarium Haunted Attraction! Insanitarium is brought to life each season by Catacomb Productions, a company who also creates and sells custom haunt music. Last season the review team, Team Scurryface, was able to pay this attraction a visit and they had this to say: “This little haunt has everything needed to scare, terrify, and cause laughter. 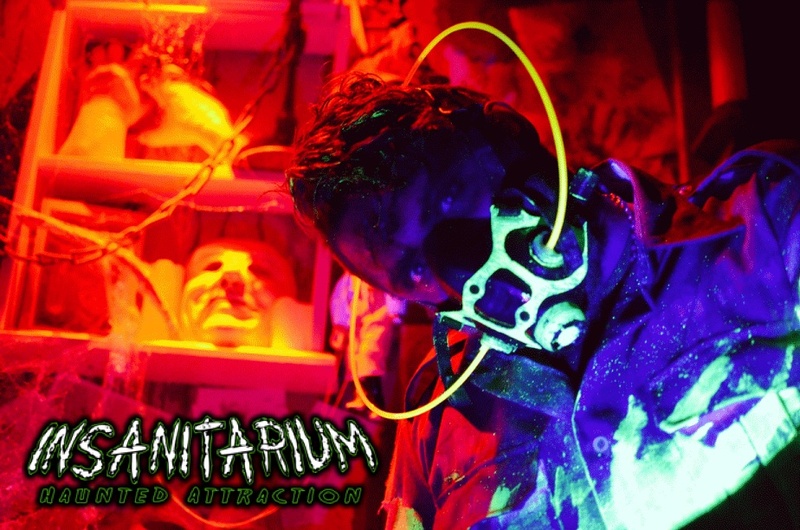 Insanitarium is a perfect, Birmingham-local haunt with a charitable heart and a terrifying personality.” General admission during the 2015 haunting season was only $10.00! You won’t find prices that low very often anymore, so try to take advantage of them while you can! It is also said that Insanitarium’s building is truly haunted! Insanitarium’s overall Scare Factor score for the 2015 haunt season was a 9.43 out of 10! Field of Screams comes in at number 11 on our list and was home to 4 diverse attractions in 2015. FOS has been in operation since 1990 and fills their platter with something unique from the haunt industry table each season. It may take your group up to 75 minutes to complete all of the attractions and even longer if you are one of those who cowers in the corner! Our review team, Team Scary Potter, also had the pleasure of visiting this attraction last year and said, “You’re not going into an attraction that has 5 minutes of ‘meat’, with ten minutes of fluff – you’re getting the good stuff from end to end. We had an absolute blast and HIGHLY RECOMMEND to anyone reading this to make time in your weekend to visit Field of Screams this year. Definitely one of this year’s best.” We would also like to point out that Team Scary Potter gave Field of Screams a Fright Effect score of 9.88….Now that’s a good indication that this haunted attraction has got some scares up their sleeves! Their overall 2015 Scare Factor score was a 9.47 out of 10! Filling in our number 10 spot is one of the most well-known haunted attractions in the country for bringing movie sets to life. 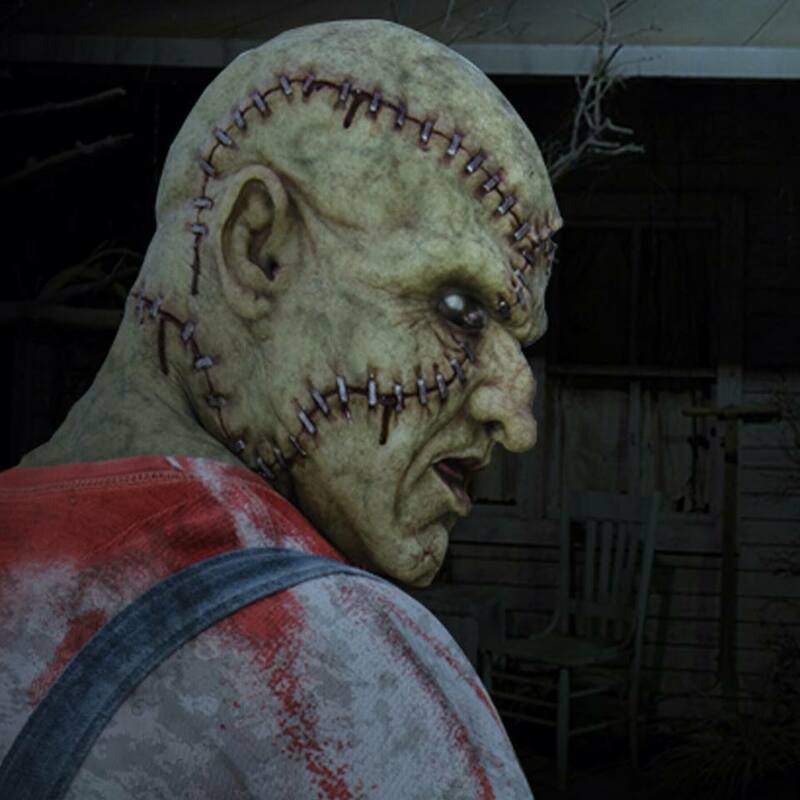 Enter: Halloween Horror Nights – Universal, Orlando! 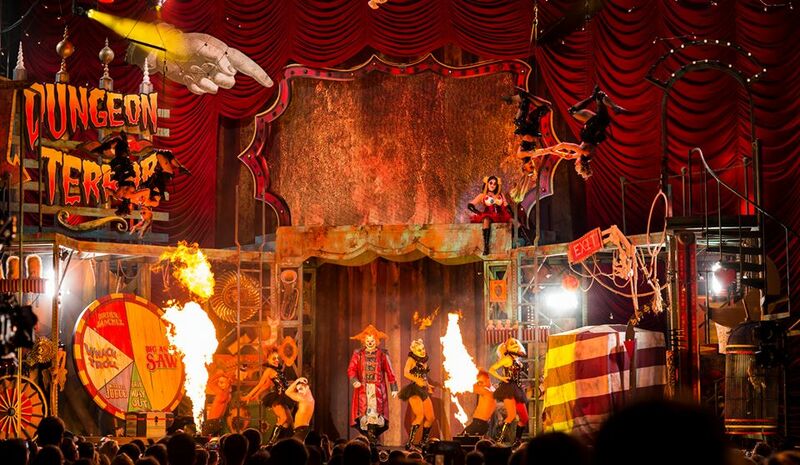 Last season HHN consisted of 9 haunted houses, 2 shows and 5 scare zones! 2016 will be their 26th season and we can’t wait to see what they have in store for everyone! You will be able to journey to the various scare zones to get your fright fix, ride many thrilling rides, or check out some of the park’s other attractions! Last season, one of Team Scurryface’s members reviewed HHN and claimed, “This is one of the best haunted events I have ever had the pleasure of attending.” HHN was also given a score of “10” under our Cast scoring category as well as Atmosphere, Special Effects, Theme and Value! HHN’s overall Scare Factor score in 2015 was a 9.48 out of 10! 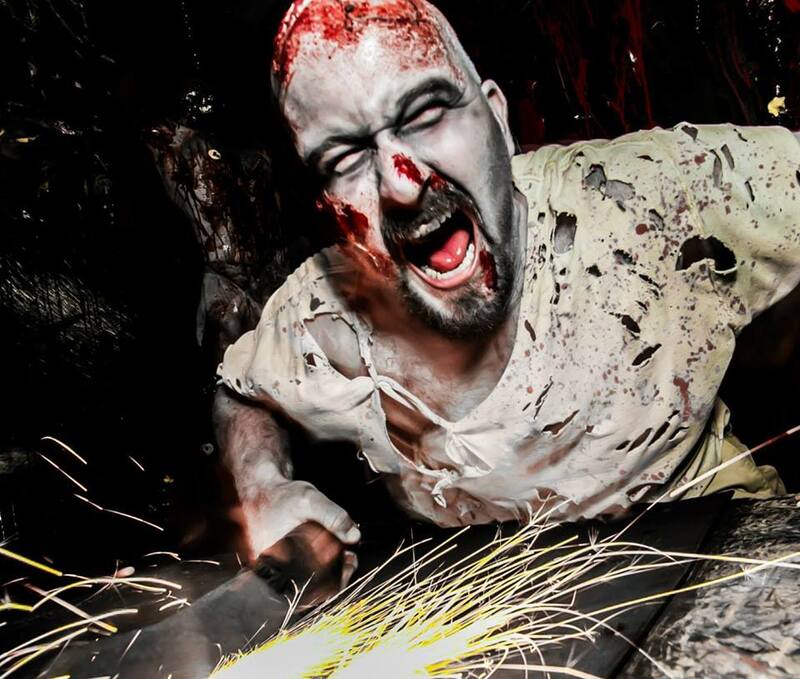 This haunted attraction always seems to make our top lists and they’ve done it again! Taking the 9th spot on the board is The Dent Schoolhouse. It’s said that this attraction takes place in a public school that opened in 1894. The haunt’s story revolves around a child-murdering janitor known as Charlie, who still roams the school’s many halls to this day…. and we’ll tell you HE IS EVERYWHERE! What’s even creepier is that the story of Charlie is also said to be true, so you may want to leave the little ones at home! Tour time varies, but it could take you as long as 35 minutes to skip class and avoid Charlie! 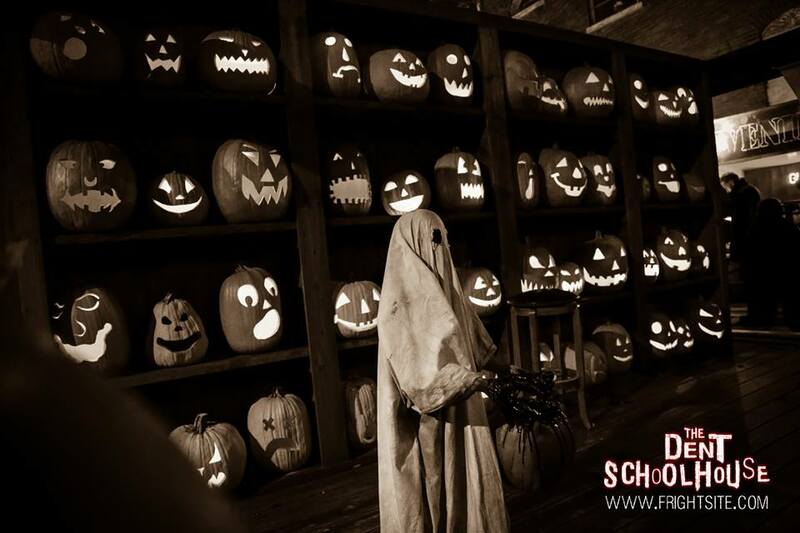 In 2015, our Scream Team Team Mysterious Misery reviewed Dent and this is some of what they had to say: “The Dent Schoolhouse is a must-see haunted attraction for 2015 and remember to be quiet; the librarian hates mouthy, little brats who always want to take selfies!” We’re sure they will have even more to offer for the 2016 season! Dent’s overall Scare Factor score in 2015 was a 9.5 out of 10! 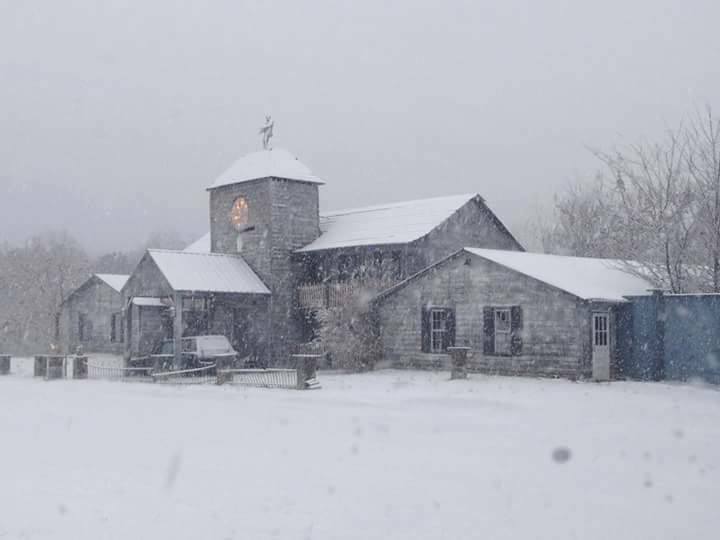 Arx Mortis at Ghosthill takes our number 8 spot and, in case you didn’t know, the Latin meaning of Arx Mortis is “The Castle of Death!” Now you’re already ready to go there, right? This attraction also implements a “group” waiting system so you are free to roam and enjoy your wait instead of being forced to stand in a line the whole time. This was another attraction reviewed by Team Scurryface in 2015 and they had this to say: “Arx Mortis is effective at providing a quality haunted attraction experience. Based on everything I had the pleasure of experiencing, from the drive to the final steps out the door, it was worth every penny.” This review team also scored them a “10” in our following scoring categories: Customer Service, Atmosphere, Special Effects and Theme. Arx Mortis’ overall 2015 Scare Factor score was a 9.5 out of 10! Yet another haunted attraction that’s making its rounds to multiple lists and coming in at number 7 on this one is Ruby Falls Haunted Cavern. A portion of this attraction does take place 26 stories beneath the Earth’s surface, and obviously in a cave, so dress accordingly. Estimated tour times are about 45 minutes and in 2015 the entire experience was made up of 3 levels including “the lower haunt,” the bus ride and “the upper haunt.” One of the members from Team Scurryface made their way to review this attraction in 2015 and said, “I guarantee you will get startled in this haunt at least once, especially if you are the leader of the group.” If you’re a chicken and you obviously don’t want to be first, or probably last either, the middle must be the safest place to be! Ruby Falls received multiple scores of “10” in our scoring categories including Customer Service, Theme and Fright Effect! Oh yea, and if you’re creeped out by what you CAN see in this cave, just think about the hideous creatures lurking in the dark that you CAN’T see… at least, yet! Ruby Falls’ overall 2015 Scare Factor score was a 9.53 out of 10! The Devils Attic’s overall 2015 Scare Factor score was a 9.55 out of 10! The Shallow Grave’s overall 2015 Scare Factor score was a 9.56 out of 10! The Haunted Hotel’s 2015 overall Scare Factor score was a 9.56 out of 10! In 2015 USS Nightmare’s overall Scare Factor score was a 9.58 out of 10! 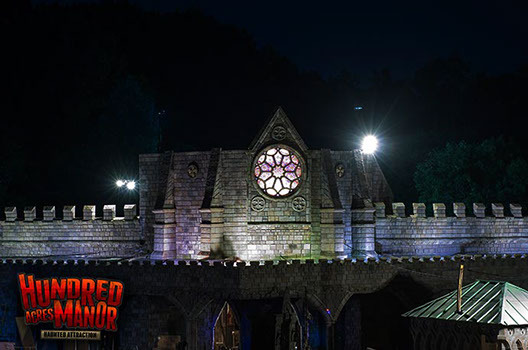 Coming in as the runner-up for “Top Haunt,” we have Hundred Acres Manor, which consisted of 6 different attractions for one low price during the 2015 haunt season! You will also find multiple escape rooms at this location to fulfill your thrill-seeking senses even more. 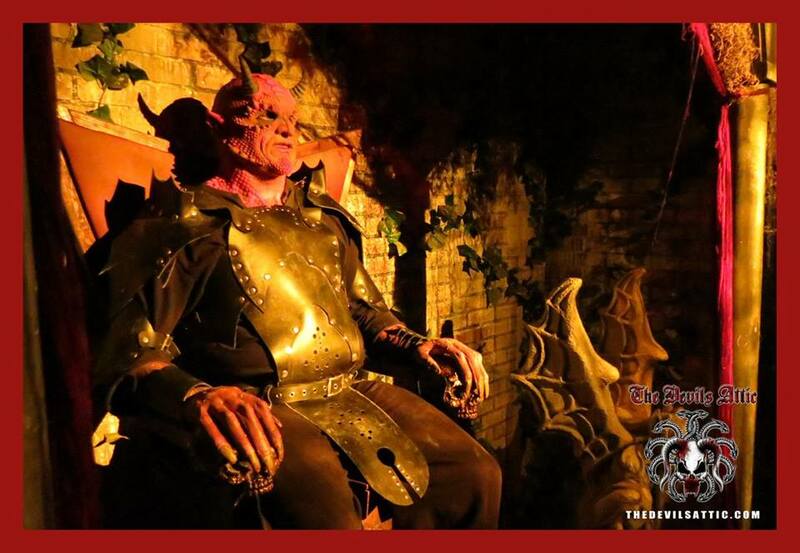 Our review team, Team Scary Potter, had the pleasure of reviewing this haunt last season and, although they were unable to test their skills in the escape rooms, they were able to enjoy all of the haunts. 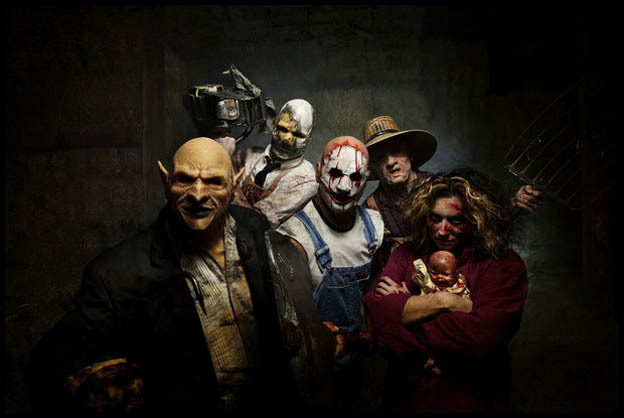 They stated in their review that, “At Hundred Acres Manor, you will NOT be disappointed. Do you like actor-induced, jump scares? Perhaps you prefer animatronic freak-outs or environmental-hazard trauma. Extreme assault or subtle creepiness? Don’t worry, you’re covered. Scares at 1AM are varied and frequent. The 100-200 actors come at you in every shape, from every angle, and with every frightening disposition that you can imagine and they hit every member of your group.” Now that sounds like a scary-good time, right? And with a Fright Effect score of 9.88, we can only agree! 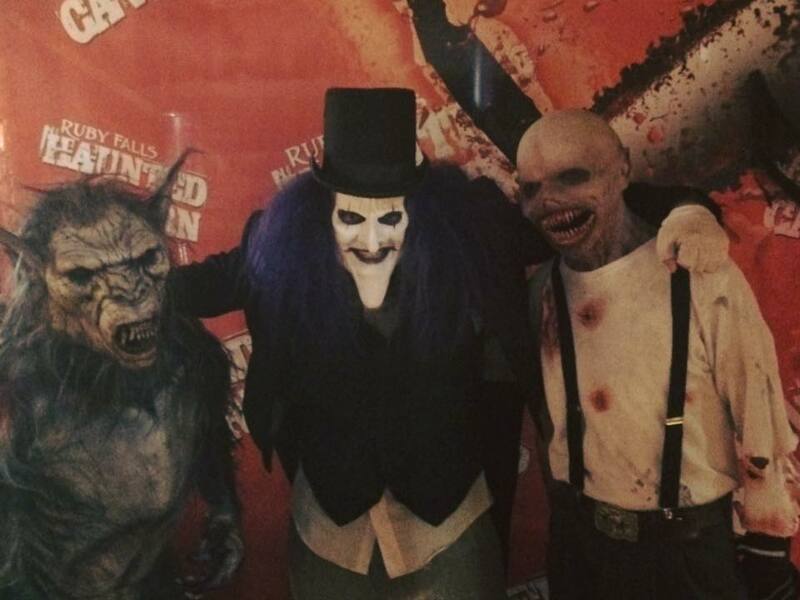 Hundred Acre Manor’s 2015 overall Scare Factor score was a 9.68 out of 10! Statesville Haunted Prison’s overall 2015 Scare Factor score was a 9.71 out of 10! What are some of the best haunts you’ve been to? Tell us in the comments below!